Individual puzzle pieces painted by art students at Lugoff-Elgin High School have been connected to create one piece of art, which is currently on display at Central Carolina Technical College in Camden. 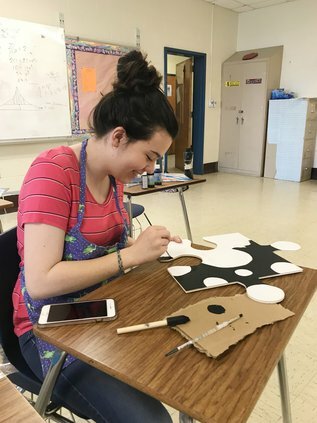 Hanna Wagner, L-EHS Class of 2019, works on painting the background of her puzzle piece. 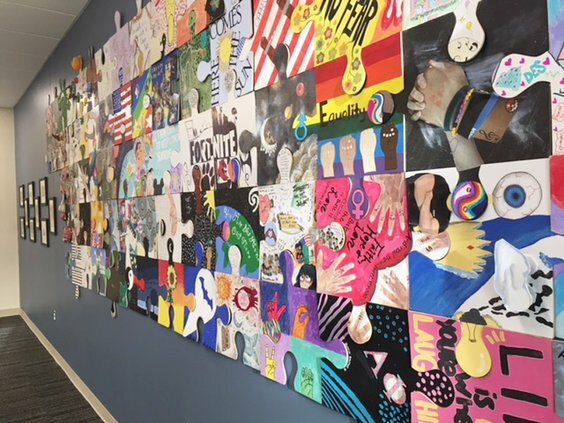 In May 2018, L-EHS students painted their individual puzzle pieces to represent their personalities and share messages of encouragement with one another. In the days following the massive shooting at Marjory Stoneman Douglas High School, Mrs. Gina Bruce, art teacher at Lugoff Elgin High School, listened to her students as they expressed feelings of helplessness. Her art students believed teenagers acted out through violence because they had no other outlet through which to express themselves. Bruce began to research activities she could use to help her students find their voices. 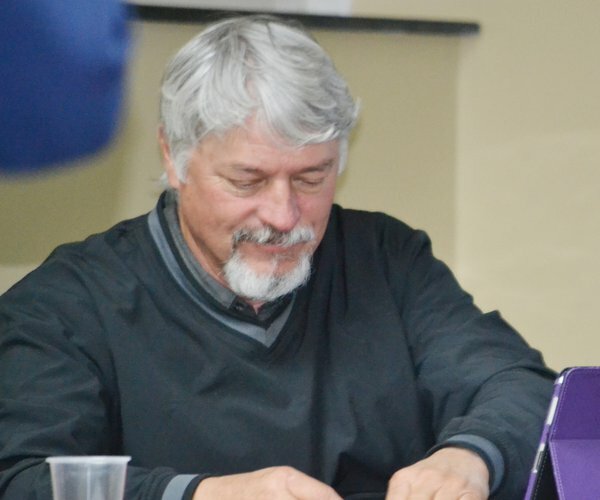 That’s when she found Tim Kelly’s Puzzle Project and thought it could be remodeled to fit the Lugoff Elgin community. Her principal, Worth Thomasson, loved the idea and got on board to provide initial funds for supplies. “I didn’t have to twist his arm. He saw the benefit right away,” Bruce said. This collaborative project provides teens and adults alike a safe place to express their feelings and discuss current issues. To help with the project, Derek Napper, ATEC’s Digital Art & Design instructor, agreed to cut the 17 x 17 inch puzzle pieces needed for the project. Bruce provided each student with one puzzle piece and encouraged them to use it as their blank canvas. More importantly, she also provided them with freedom to say whatever they wanted to say on their piece. “[This project] gave them a voice that they sometimes don’t have and that was very powerful,” Bruce said. While all students had access to the same size puzzle piece and the same art supplies, that is where the similarities ended. Bruce instructed the students to make their pieces their own, so each student’s work is unique, but each puzzle piece fits together to make one large, cohesive piece of art. 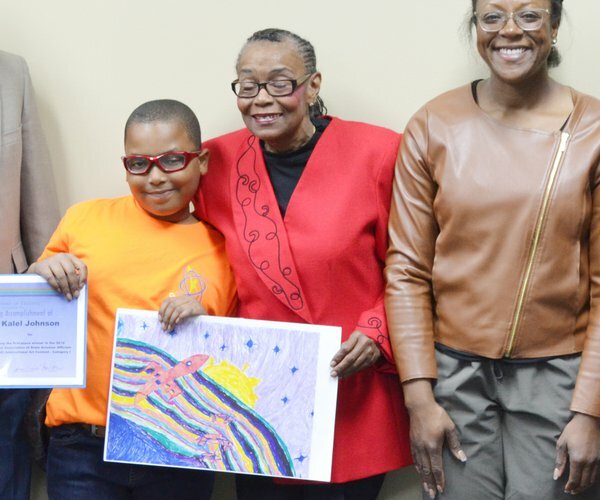 The puzzle created by Bruce’s students is currently on display at Central Carolina Technical College, which is located at 90 Campus Drive, Camden, SC 29020. The Puzzle Project is an installation project, and Bruce hopes what she has begun at Lugoff Elgin will eventually grow to include the other two high schools in Kershaw County. Eventually, she would like to see all high schools in the state of South Carolina participate. If you would like to be a part of this project or would like to house the Puzzle Project, please contact Gina Bruce at gina.bruce@kcsdschools.net.